carried in Higgins boats.4 The plan for landing on each island required that the rubber boats be towed by a launch to within 800 yards of the shore and then be paddled to a rendezvous halfway in. There they were to wait until two men went forward on an electric-powered raft, made a beach reconnaissance, and set up directional lights marking the best landing spot. 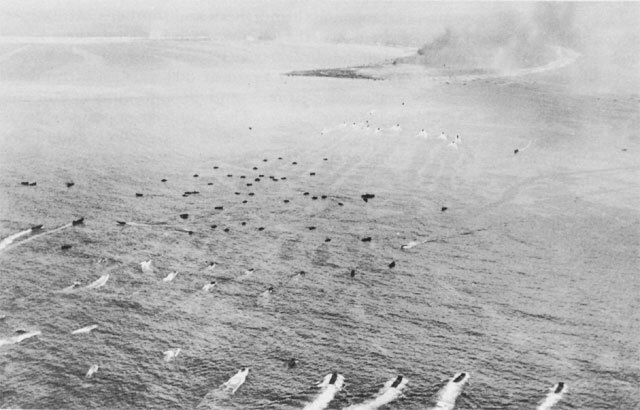 The rest of the men in the rubber boats were to follow them ashore and, while establishing a beach defense, guide the Higgins boats in with red lights. Leaving the infantry to defend the beach, the two reconnaissance platoons were first to occupy the side of the island nearest the channel and then to reconnoiter and make secure the remainder of the island. At the outset some delay was encountered in dispatching Troop B from Manley because of the difficulty in finding Carter Island. Then the lead boat mistook Cecil for Carter and by the time this confusion righted itself it was almost daylight. Hence, plans for a preliminary beach reconnaissance were abandoned, and the rubber boats were paddled to shore at the southern end of Carter at 0620. No resistance was met on the beach. Defenses were set up and the infantry boats guided in while a reconnoitering patrol struck through the fringe of brush at the edge of the beach and entered the heavy tropical undergrowth beyond. The patrol returned without discovering any enemy, and the reconnaissance platoons, with an infantry platoon providing flank and rear protection, pushed off toward an observation tower at the northwest corner of the island. The area around the tower was soon discovered to be unoccupied except for one Japanese soldier, who was killed. The first reconnaissance platoon then turned around to comb back down the island again, concentrating this time on the ocean side. 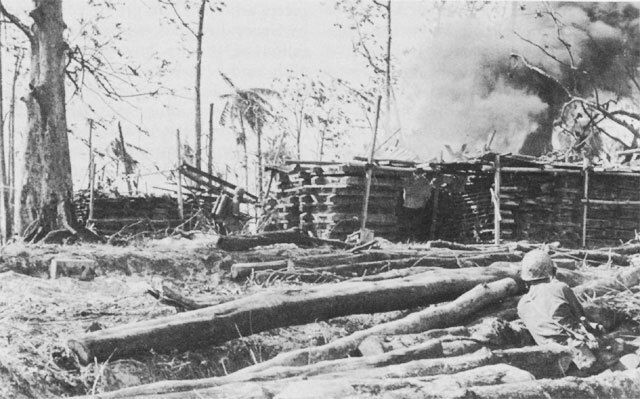 As the skirmish line pushed back into the tangle of undergrowth again, it was suddenly taken under fire from Japanese concealed in a shell crater and surrounding trees. The platoon leader, 2d Lt. Claude V. Hornbacher, ordered a machine gun set up in the crotch of a tree, and with it in position a covering fire was laid down on the whole area. Under protection of this fire, Sgt. Leonard C. Brink took personal charge of the situation. In ten or fifteen minutes he hurled grenade after grenade into the crater while the machine gun fired over his head. The Japanese replied in kind. Finally, after enemy resistance seemed to have dwindled, Sergeant Brink and other members of the platoon crawled forward and jumped into the hole with knives and bayonets. Within seconds the skirmish was over and nineteen Japanese soldiers were dead at the cost of one American wounded. The island again fell silent. A few more Japanese were flushed from their hiding places near the ocean shore, and by 0930 the capture of Carter Island was completed. Intelligence materials were gathered up and sent to Admiral Turner's flagship, Rocky Mount, and at 1000 responsibility for controlling the island was transferred to the infantry elements. The southeast side of the channel was secured. At the same time that Troop B was seizing Carter, Troop A was engaged in a parallel mission. At 0430 Troop A started from Overton toward what was supposed to be Cecil Island. The craft moved against a strong current and an offshore wind. Although the rubber boats were cast loose too soon and had to be rounded up and again taken in tow until brought within paddling distance of the shore, they made an unopposed landing at 0545, thirty-five minutes earlier than Troop B's on Carter. Guide lights were placed and the infantry's landing craft came in just at daybreak, while the beachhead defense was being established. Leaving a small party of infantrymen to stand guard over a Japanese tugboat stranded near the beach, Captain Gritta embarked the remainder of his troop in rubber boats and proceeded along the reef to Cecil. That island was found to be unoccupied and by 1235 was reported secured.6 The pass into the lagoon could now be swept in preparation for the entry of ships to provide fire support for the landings planned the next day. The seizure of Carlson and Carlos Islands on D Day was assigned to the 17th Regimental Combat Team. Carlson was to be used for the emplacement of divisional artillery and Carlos for supply dumps and repair stations. 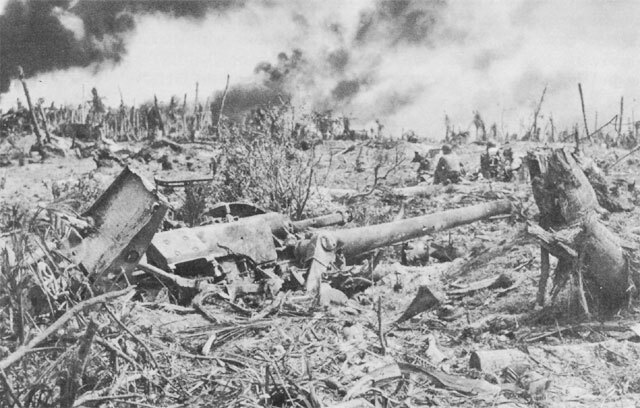 The capture of Carlson was considered the most important D-Day mission for the Southern Landing Force because of its proximity to Kwajalein Island and its importance as a site for the forty-eight 105-mm. and twelve 155-mm. howitzers that were to provide artillery support for the main landing the next day. 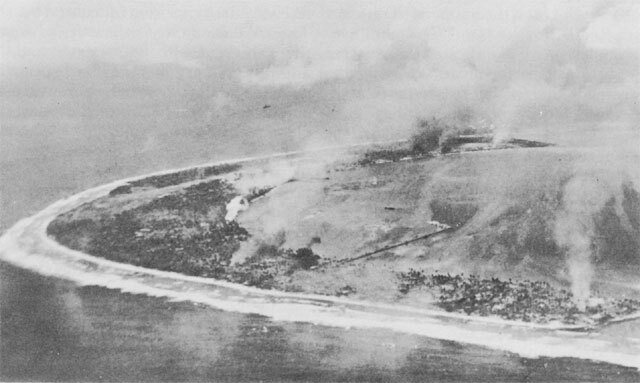 The 17th Regimental Combat Team's plan called for simultaneous attacks of battalion strength on the northwestern tip of each island.11 The 1st Battalion, Lt. Col. Albert V. Hartl commanding, was to attack Carlos; the 2d Battalion, commanded by Lt. Col. Edward P. Smith and supported by one platoon of Company A, 708th Amphibian Tank Battalion, was to land on Carlson. The 3d Battalion, Lt. Col. Lee Wallace commanding, was to remain afloat in landing craft at the line of departure and be available for either island as needed. 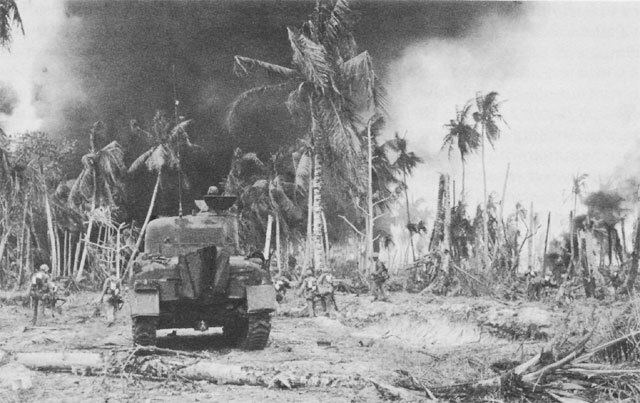 Two light tanks were designated for the fourth wave of those landing on Carlos and four were allocated to the fourth landing wave for Carlson. The tanks were provided by Company D, 767th Tank Battalion. Company C of the tank battalion was to stand by to provide support missions if called on. The transports carrying the three battalion landing teams arrived in the transport area six miles to seaward of Carlson at 0544 on 31 January.12 Five LST's carrying four amphibian tractor groups had already arrived in an assigned area westward from Carlos Island, and on order they moved through the pitch darkness to the transport area to take aboard the assault troops of the first four waves. The men were to disembark from the transports into Higgins boats, move about 600 yards to their assigned LST's, and then distribute themselves among the amphibian tractors at the rate of fifteen men per vehicle. On order, the LST's were then to move close in to the line of departure and disgorge their amphibian tractors through their open bow doors. Engineers. The second wave landed at 0920, and the third was ashore ten minutes later. LCI gunboats continued their fire until the third wave had landed. Carrier planes strafed and bombed the island, moving to the southeastern extremity by 0938. 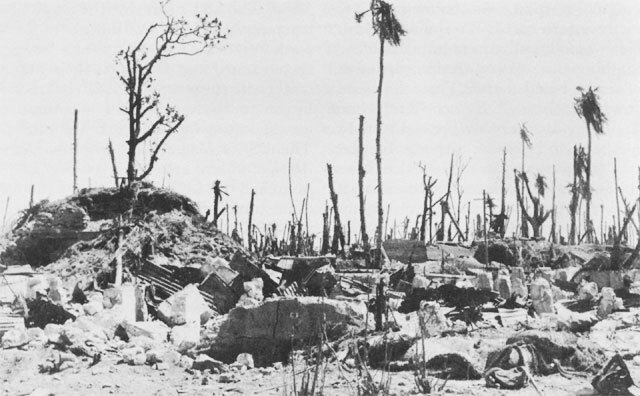 The night of D Day on southern Kwajalein found the Southern Attack Force, despite the unfinished business on Chauncey Island, with all its scheduled objectives attained. The channel islands were secured; the channel itself and an anchorage in the lagoon had been swept for mines; and a part of the invading force had entered the lagoon to take stations there. On Carlos and Carlson the Americans were in full possession. 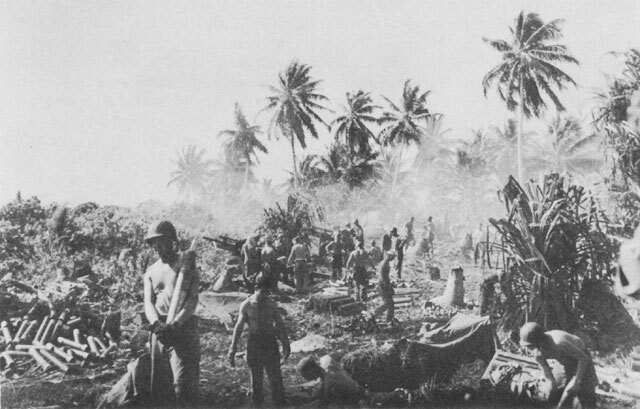 During the early afternoon, the 3d Battalion Landing Team of the 17th Infantry and one platoon of the 31st Field Hospital had been brought ashore on Carlos. By 1200 men of Company A of the 7th Medical Battalion were ashore and operating a collecting station at the beach.33 The 1st Battalion had returned to the northwest section of Carlos and the 3d Battalion, the reserve force, occupied the southeastern half. build dumps. 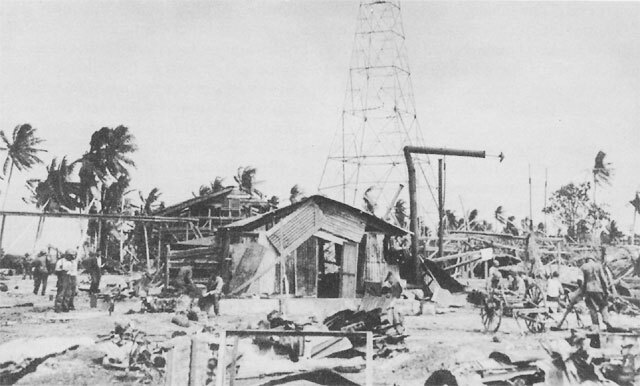 At 1800, on the northern tip of Carlos, a detachment of the 707th Ordnance Company had set up the LVT maintenance shop capable of handling heavy repairs.34 At the southern end of the island a consolidated ammunition dump was prepared during the night and was ready for use by 0800 on 1 February. Long before sunrise on the morning of 1 February 1944 the Southern Attack Force at Kwajalein Atoll moved from its night cruising dispositions to the positions assigned for the day's operations against Kwajalein Island. The eight LST's on which the leading wave of assault troops had spent the night were the first to approach their rendezvous, at 0530, and within half an hour the larger transports and the warships that were to provide fire support were taking stations. At 0618 Mississippi and Pennsylvania took up the harassing fire, which had been maintained during the night by other ships and by the artillery on Carlson.39 Squalls, frequent rain showers, and scudding clouds lowered visibility. They threatened to hamper the attack but not to compel either its postponement or the adoption of the alternative plan for a complicated landing from the lagoon.40 The assault was to be made from the ocean against the western end of Kwajalein Island. The first waves of the 3d Battalion, 184th, commanded by Lt. Col. William P. Walker, and of the 1st Battalion, 32d, under Lt. Col. Ernest H. Bearss, started for the shore precisely on time at 0900 after receiving the signal from the control boat.54 The LVT's mounted at least two, sometimes three, machine guns each, and, in addition, twenty of them had specially mounted infantry-type flame throwers that could be operated from the assistant driver's seat.55 At each outside wing and in the center between the first two waves, platoons of amphibian tanks were echeloned. From their turrets, 37-mm. guns protruded. Behind the first wave came three succeeding waves of infantry at two-minute intervals. While some elements of the first four waves pressed forward in the wake of the artillery barrage and others organized the beaches, additional infantry and units of supporting arms and services continued to come ashore throughout the day. 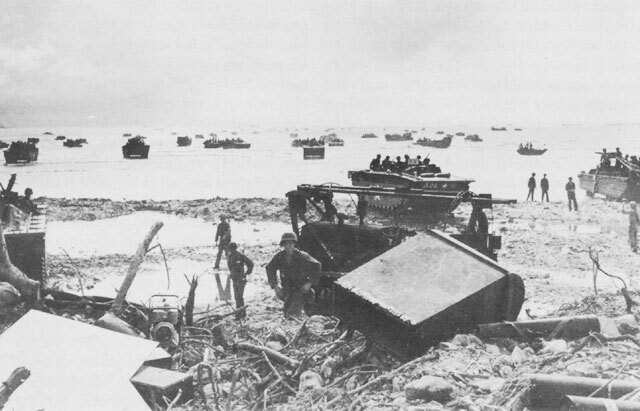 Throughout 1 February the Southern Landing Force thus built up its assault and support elements on the western end of Kwajalein Island as rapidly as reef and beaches could be crossed. 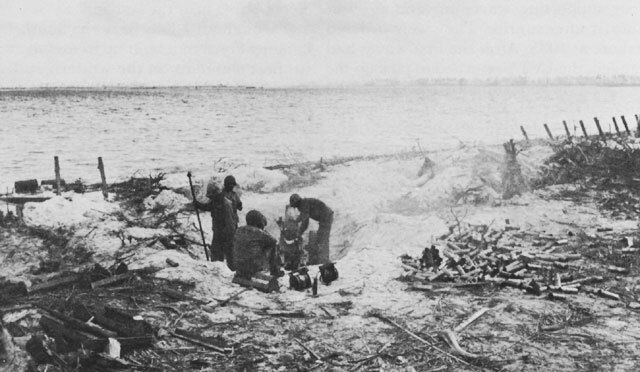 Their task was relatively easy because of the light opposition encountered on the beaches. The confusion that had marked the landing of assault and support units at Tarawa was nowhere apparent at Kwajalein. Naval, artillery, and aerial bombardment had done their work well. The troops had been carried ashore on schedule and in sufficient number to sustain the assault. The ship-to-shore movement was an eminent success. 1. TF 51, Rpt of Opns for the Capture of the Marshalls (hereafter cited as TF 51 Marshalls Rpt), Incl C, p. 2. 2. 7th Cavalry Reconnaissance Troop, Rpt of Kwajalein Opn, 20 Feb 44 (hereafter cited as 7th Cav Rcn Tr Rpt), p. 1; 111th Infantry Report After Action Against Enemy, 31 Jan-1 Feb 44, 15 Apr 44 (hereafter cited as 111th Inf AAR). 3. 7th Inf Div FLINTLOCK Rpt, Vol. II, FO 1, 6 Jan 44, Phase 1, pp. 1-2; 7th Cav Rcn Tr Rpt, pp. 4. 7th Cav Rcn Tr Rpt, p. 2. Unless otherwise indicated, the account of the action on Chauncey, Carter, and Cecil Islands is drawn from this report or that of the 111th Infantry. 5. 7th Inf Div FLINTLOCK Rpt, Vol. VI, G-3 Jnl, 31 Jan 44, Msgs 22a, 23; Marshall, Kwajalein Notes, Vol. II, pp. 20-21. 6. 7th Inf Div G-3 Jnl, 31 Jan 44, Msg 90. 7. 111th Inf AAR, p. 3. 8. 7th Cav Rcn Tr Rpt, p. 6. 9. 7th Inf Div FO 1, Annex 3, App 4, p. 9. 10. 7th Inf Div FLINTLOCK Rpt, Vol. II, FO 2, 6 Jan 44, pp. 1-4. 11. Ibid., Vol. VIII, RCT 17 FO 1, 17 Jan 44, p. 2. 12. TF 51 Marshalls Rpt, Incl A, p. 2: 7th Inf Div FLINTLOCK Rpt, Vol. VIII, RCT 17 Rpt of Opns, 15 Feb 44 (hereafter cited as RCT 17 Rpt), pp. 3, 63, 64; 767th Tk Bn FLINTLOCK Rpt, pp. 84-85. 13. 7th Inf Div G-3 Jnl, 31 Jan 44, Msg 14. 14. LST 224 Action Rpt Kwajalein, 8 Feb 44; 767th Tk Bn Jnl, 31 Jan 44, p. 3. 15. TF 51 Marshalls Rpt, pp. 32-33 and Incl E, App 2, p. 1. 16. Ibid., Incl E, App 2, p. 1. 17. 7th Inf Div FO 1, Annex 8; Marshall, Kwajalein Notes, Vol. 11, p. 12; RCT 17 Rpt, Jnl, 31 Jan 44, Msgs 31, 37. 18. Marshall, Kwajalein Notes, Vol. 11, p. 12; RCT 17 Jnl, 31 Jan 44, Msgs 31, 37. 19. Marshall, Kwajalein Notes, Vol. II, p. 14; RCT 17 Rpt, S-2 Worksheets, p. 133. 20. Marshall, Kwajalein Notes, Vol. II, pp. 14-15 RCT 17 Rpt, pp. 4, 137-39. 21. RCT 17 Jnl, 31 Jan 44, Msgs 15, 23, 24, 26. 22. 767th Tk Bn Jnl, 31 Jan 44, p. 3; RCT 17 Rpt, p. 4. 23. Lt Paul R. Leach, Tanks on Kwajalein Atoll, MS, p. 7, OCMH. 26. 7th Inf Div G-3 Jnl, 31 Jan 44, Msgs 67, 72. 27. 7th Inf Div Southern Landing Force Arty Rpt Kwajalein Opn, 12 Mar 44, pp. 3-11. 28. 145th FA Bn Rpt Of FLINTLOCK Opn, p. 4. 29. 7th Inf Div Rpt, use of DUKW's by the Artillery of the 7th Infantry Division in the FLINTLOCK Operation, 4 Apr 44, p. 5. 30. 7th Inf Div Southern Landing Force Arty Rpt Kwajalein Opn, pp. 7, 13. 31. Of these, 45 percent were high explosive, 40 percent time-fuzed, and 15 percent smoke. 7th Inf Div FLINTLOCK Rpt, Vol. XII, Arty Rpt, S-4 Rpt on Kwajalein, p. 2. 32. 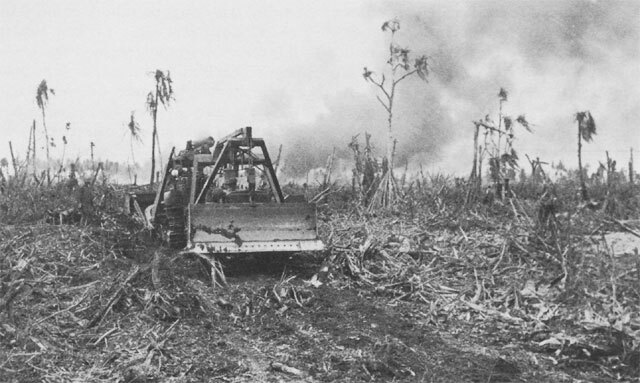 Cpl Millard Rogers, The Artillery Action of the Battle of Kwajalein Atoll, MS, p. 21, and App II, Map 1, OCMH. 33. 7th Inf Div Med Bn Rpt of Activity During FLINTLOCK Opn, 22 Jan 8 Feb 44, pp. 12, 23. 34. 7th Inf Div FLINTLOCK Rpt, Vol. VII, G-4 Rpt, Annex F, QM Rpt, p. 1, and Annex E, Ordnance Rpt, 707th Ord Co Narrative Rpt, p. 1. 35. 7th Inf Div Southern Landing Force Arty Rpt Kwajalein Opn, p. 11; 145th FA Bn Rpt Of FLINTLOCK Opn, p. 171; 7th Inf Div G-3 Jnl, 31 ,Jan 44, Msgs 87, 125. 36. TF 51 Marshalls Rpt, Incl A, p. 4. 37. Ibid., Incl E, pp. 7-8. 38. 7th Inf Div G-3 Jnl, 31 Jan 44, Msg 122. 39. TF 51 Marshalls Rpt, Incl E, App 2, p. 4. 40. Ibid., Incl F, p. 3. 41. Ibid., Incl E, App 2, p. 4. 42. Ibid., Incl E, App 1, Table 3. 43. 7th Inf Div Southern Landing Force Arty Rpt Kwajalein Opn, p. 11. 44. Operational History of the Seventh Air Force, 6 Nov 43-31 Jul 44, p. 125; Craven and Cate, AAF IV, p. 306. 45. CINCPAC-CINCPOA Opns in POA, Feb 44, Annex A, p. 35; TF 51 Marshalls Rpt, Annex F, p. 3. 46. CINCPAC-CINCPOA Opns in POA, Feb 44, Annex A, p. 35; TF 51 Marshalls Rpt, Incl E, p. 11. 47. TF 52 Attack Order A1-44. 48. 7th Inf Div FLINTLOCK Rpt, Vol. XI, RCT 184 Rpt of Opns and Jnl, 31 Jan 6 Feb 44 (hereafter cited as RCT 184 Rpt and RCT 184 Jnl), p. 2. 49. 7th Inf Div G-3 Jnl, 1 Feb 44, Msg 13; 767th Tk Bn Jnl, 31 Jan 44, pp. 2, 32. 50. LST 224 Action Rpt Kwajalein, 8 Feb 44. 51. 7th Inf Div G-4 Rpt, Annex A, Initial Combat Supply, p. 3. 52. 7th Inf Div FO 1, p. 7; 7th Inf Div FO 2, p. 2. 53. Marshall, Kwajalein Notes, Vol. 1, pp. 5-6. 54. 7th Inf Div G-3 Jnl, 1 Feb 44, Msg 22. 55. Flame throwers were also installed on eighteen light tanks. 767th Tk Bn FLINTLOCK Rpt, pp. 52, 53; Marshall, Kwajalein Notes, Vol. I, p. 2. 56. Marshall, Kwajalein Notes, Vol. I, pp. 1-6. 58. Ibid., p. 14; 7th Inf Div FLINTLOCK Rpt, Vol. IX, RCT 32 Rpt of Opn PORCELAIN (Kwajalein) Island, and Jnl, 31 Jan-6 Feb 44 (hereafter cited as RCT 32 Rpt and RCT 32 Jnl), p. 30. 59. Marshall, Kwajalein Notes, Vol. 1, p. 7; RCT 32 Rpt, p. 30. 60. RCT 184 Jnl, 1 Feb 44. 61. Marshall, Kwajalein Notes, Vol. I, p. 14. 62. RCT 32 Jnl, 1 Feb 44, Msg 18. 63. 7th Inf Div G-3 Jnl, 1 Feb 44, Msg 45; 767th Tk Bn Jnl, 1 Feb 44, p. 4; Marshall, Kwajalein Notes, Vol. I, p. 3. 64. RCT 32 Jnl, 1 Feb 44, Msg 18a. 65. RCT 184 Jnl, 1 Feb 44. 66. Marshall, Kwajalein Notes, Vol. I, pp. 9, 15, 94. 67. RCT 32 Jnl, 1 Feb 44, Msg 50; Marshall, Kwajalein Notes, Vol. 1, p. 9; 767th Tk Bn Jnl, 1 Feb 44, p. 4. 68. 767th Tk Bn Jnl, 1 Feb 44, p. 6; Leach, Tanks on Kwajalein Atoll. 69. RCT 32 Jnl, 1 Feb 44, Msg 54. 70. Marshall, Kwajalein Notes, Vol. I, p. 95; RCT 32 Rpt, p. 34. 71. 7th Inf Div FLINTLOCK Rpt, Vol. XI, RCT 184 Rpt of Opns, BLT 184-1 Rpt of Opns, Jnl, 1 Feb 44, p. 87. 72. 91st Chemical (210 Rpt of Participation in Kwajalein Opns, 18 Feb 44, pp. 131-41. 73. RCT 32 Rpt, p. 22. 74. RCT 184 Rpt, p. 43. 75. 7th Inf Div Med Bn Rpt of Activities During FLINTLOCK Opn, 22 Jan 8 Feb 44, pp. 13, 14. 76. Ibid., pp. 14, 15. 77. RCT 184 Rpt, p. 37. 78. RCT 32 Jnl, 1 Feb 44, Msgs 29a, 35, 101.